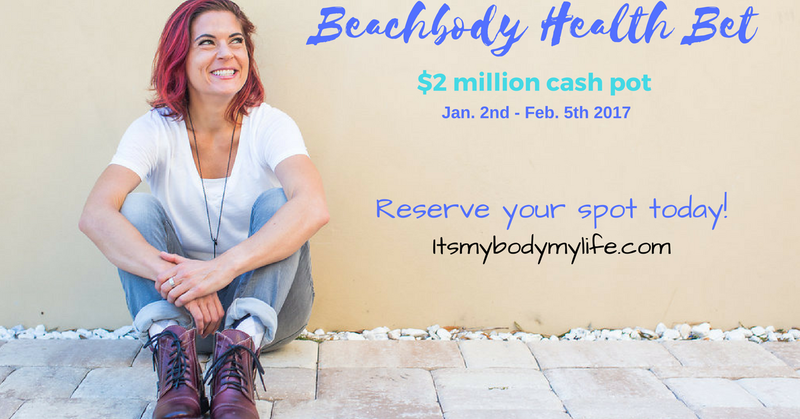 The Beachbody Health Bet is Back! We already know that sticking to a New Years resolution can be hard, if not sometimes impossible, but both Beachbody and I's goal is to make your health and fitness resolutions A whole lot easier! The Beachbody Health Bet is back this January, and the pot will have a minimum of two million dollars, to an astounding maximum of three million dollars! YOU have the chance to earn money just for sticking to your health and fitness plan this January! Although it's not all about the potential earning, I sure wish that they had something like this when I started my fitness journey on a New Years resolution back in 2011. The last time we did the Beachbody Health Bet back in September participants had some serious results. The extra accountability of checking in on the app and making sure they got it done so they wouldn't lose their piece of the pot was HUGE! Want to join me and make 2017 your best year yet? Here’s how it works. You join my January 2nd Health Bet challenge and between the dates of January 9th through February 5th, you log a minimum of five Shakeology uses with a photo and three workouts during each week on the Challenge Tracker app. If you meet all of the requirements during the four qualification weeks, YOU will get a piece of the prize pool! Seriously....win money just for staying on track? Sounds good to me! To get into the Jan. 2nd Health Bet Challenge, please fill out the application below and I will get back to you ASAP. If you already have a Beachbody coach that you work with, please ask them about their Beachbody Health Bet challenge!